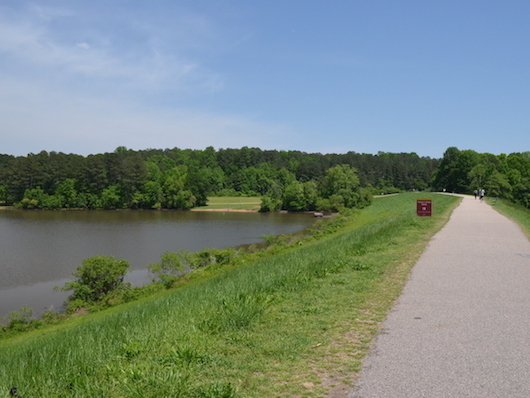 Another one of several pleasant lakeside trails in the Raleigh area. Located 7 miles north of downtown and just north of I-440, there’s a 2-mile trail paved around the lake, called the Greenway Trail. There are decent water views along some of the trail. For a longer run, there are trails that continue at the north and south ends of the lake. North, the Milne Creek Trail, and south, the Ironwood Trail each continue a couple of miles. Car needed. Bus goes from downtown, but long.